Fast maximum aperture telephoto lens optimised for digital SLR cameras. 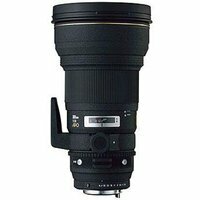 This telephoto lens has a fast maximum aperture, and also features a new super multi-layer coating, which optimizes the characteristics of digital SLR cameras. A versatile, fast aperture telephoto lens for both digital and film SLR cameras. Two ELD glass elements reduce chromatic aberration to a minimum and also ensure sharp, quality images of high contrast.